I was excited too! I have the game now and let me tell ya, it is awesome! You can choose from an Icelandic pony, a Shetland and a Falabella. It was hard to pick because they are all super cute! I give it 5 stars because I was shocked with the preciseness of the how the horses grow, they don't make the mane and tail immediately long, it has to grow from small, medium to large. I got this game a long time ago and never really played it, but I finally started too. I learned that it is really a great game, if you don't know what your doing it isn't very fun. In order to make your pony grow up you need to enter it into a breeding contest. I would recommend this game! I love this game! It's so cool! Even my horse, Duke likes it! I play it in the barn near him all he time. This could have been MUCH better if only you got the ponys as adults. I got a shetland pony named Harold. I could never get him to grow up and I also found grooming him very annoying. I eventually ended up selling this game to gamestop. My advice, DO NOT BUY THIS GAME. If you have you're heart set on playing and really really want it, rent it. 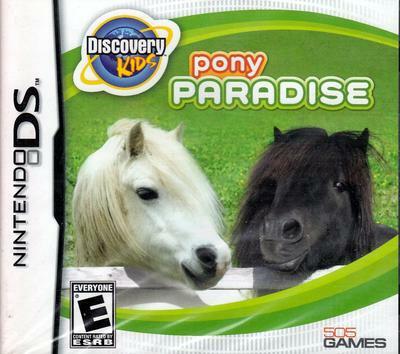 Pony Paradise is a boring waste of money. it is awesome! let me tell ya all, you get too chose from a Iceland pony or a fallabella or a shetland and their tails grow from small, medium and large! it is amazing! This game is amazing!!!!!! I feel like I own a horse!! I love horses so this is perfect for me.